Last year, Nature Genetics published findings by a team of ANRF Alumni at the Medical University of South Carolina (MUSC) uncovering a previously hidden genetic risk factor. This team of MUSC researchers published that a variant (p.Arg90His) in neutrophil cytosolic factor 1 (NCF1, a regulatory subunit of the phagocyte NADPH oxidase) is associated with increased risk for several autoimmune diseases, including systemic lupus erythematosus (SLE), rheumatoid arthritis (RA), and Sjögren’s syndrome. The amino acid substitution causes reduced reactive oxygen species (ROS), highlighting the risk of reduced ROS in developing autoimmune diseases. Their journey started several years ago, when the team was genotyping DNA samples from Chinese, European-American, and African-American SLE patients. An impressively strong signal in the Chinese sample at the rs73366469 locus (GTF2IRD1–GTF2I intergenic region at 7q11.23) caught their attention. 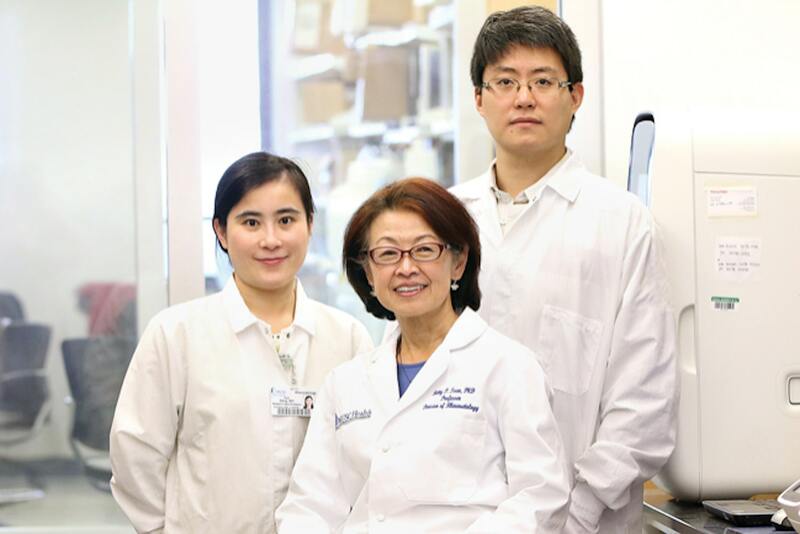 “This was the strongest signal I’d ever seen in autoimmune disease,” says Betty Pei-tie Tsao, PhD, MUSC Professor of Medicine, Richard M. Silver Endowed Chair for Inflammation Research and senior author. But the signal was only moderate in the European-American sample and nonexistent in the African-American sample. “A true risk gene should be the same in all populations,” says Dr. Tsao. The team concluded that the true risk factor lay elsewhere. But explaining this unusually strong signal wasn’t going to be easy. The team had been using the Immunochip for fine-mapping — a widely used tool for conducting genome-wide association studies. However, because rs73366469 did not show linkage disequilibrium (LD) with any single-nucleotide polymorphisms (SNPs) in the Immunochip, they hypothesized that the SNP containing the true underlying risk factor was not included in it. Realizing that next-generation mapping techniques would limit their ability to find unique sequences among all the copies and duplications in this region, the team set up their own novel polymerase chain reaction (PCR) assay. It took several years and multiple experiments in various ethnic populations before they finally identified the SNP, p.Arg90His, as the genetic variant causing SLE susceptibility. That SNP was also associated with increased risk for other autoimmune diseases, including RA and Sjögren’s syndrome. The laborious nature of this work points out an important unmet need in genetic mapping and the need for more support of this critical work.